Welcome to Magazine Monday #5! Y'all know I have a complicated relationship with Rachael. 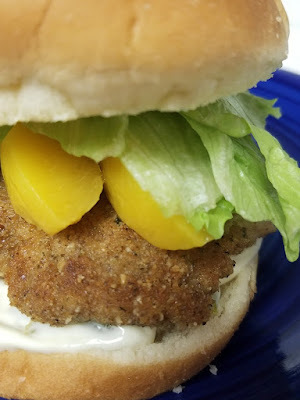 Throughout the course of this blog's 6 years, she has tried to convince me that taco meat was hamburgers; that beans are an appropriate pasta side dish; that "shredded lettuce" isn't just a fancy way of saying "salad;" and that "stoup," which is not a thing, can be made in 15 minutes. 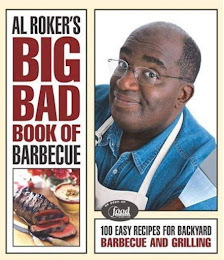 On the other hand, she HAS provided more than a few really excellent and tasty recipes, so I honestly just don't know what to do with myself. 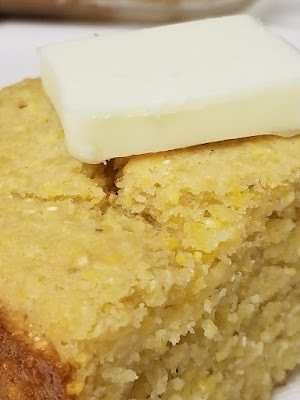 I call myself a Southerner, but it occurred to me that I'd never made cornbread before. 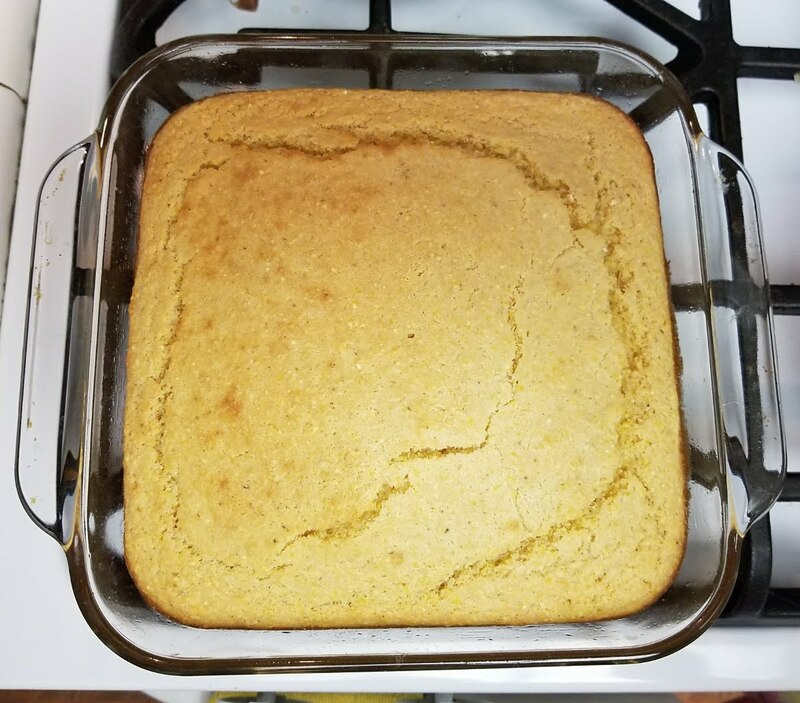 I found a recipe from Rachael in my files and made my first batch of cornbread. It turned out...OK. I wasn't wowed by it, but it turned out fine. 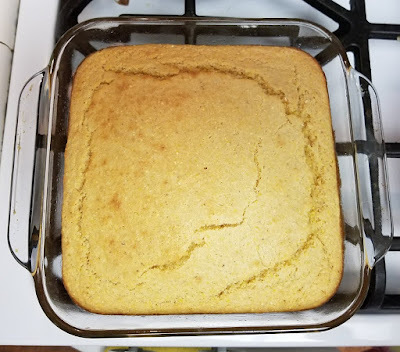 I think a mistake I made was that my cornmeal wasn't fine enough because it seemed...gritty. Give this one a shot, and tell me how it turns out for you. Try it with some chili, maybe. I'll be on the lookout for other recipes to try so I can compare. 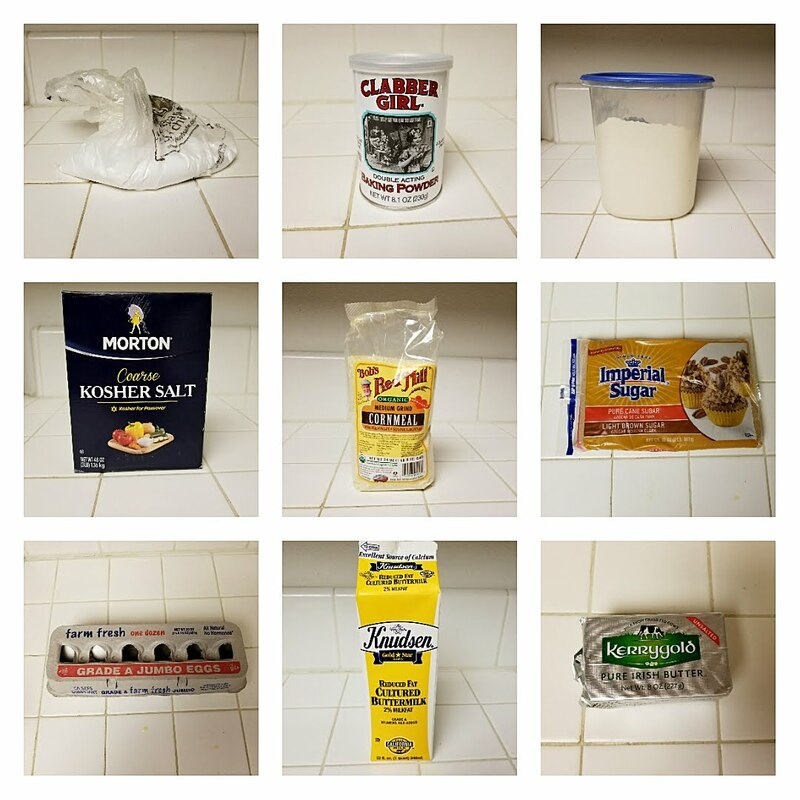 In a medium-sized bowl, whisk together the flour, cornmeal, baking powder, baking soda, and salt. 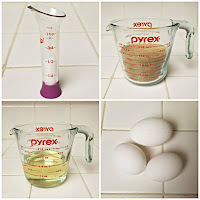 In a separate bowl, whisk together the buttermilk, eggs, and brown sugar. Fold the wet ingredients into the dry ingredients, then fold in the butter. Pour into an 8-inch ovenproof skillet (or an 8x8 inch glass dish, which is what I used) and bake for about 30 minutes, or until a toothpick inserted into the center comes out clean. As you may or may not recall, I grew up in North Carolina and have only been here in California for 4 years. I'll tell you...I would love to go back east. I don't need to get into all of the reasons, but California just isn't for me. They don't know how to make coleslaw, the closest Bojangles is 2,085+ from here, and when people say "barbeque," they're generally referring to tri-tip, which I swear to you isn't even a real cut of beef. I was happy that NSF Day is on a Monday this year, because I've had this recipe in my files forever, and this seemed like the perfect opportunity to try it out. You guys? This sandwich is amazing. I know I say that about a lot of things, but this is SO GOOD. Dennis fell absolutely in love with it, and I can't wait to make it again. 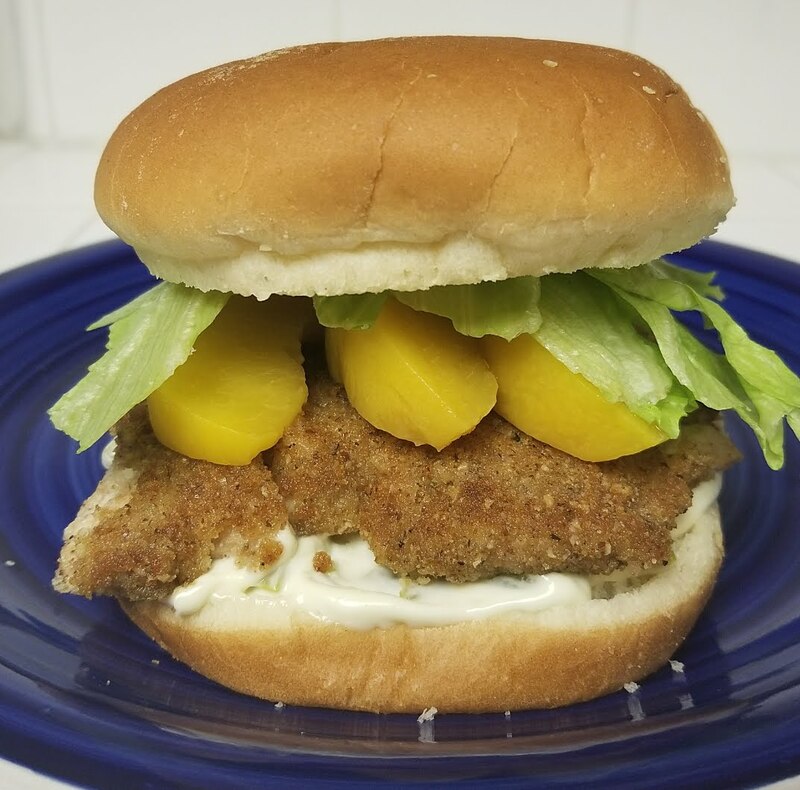 The peaches I used here were canned because it's January and despite it pretty much being summer year-round around here, it's still not fresh peach season, but I imagine this would be even better with fresh peaches. In a medium bowl, combine the chicken and the buttermilk. 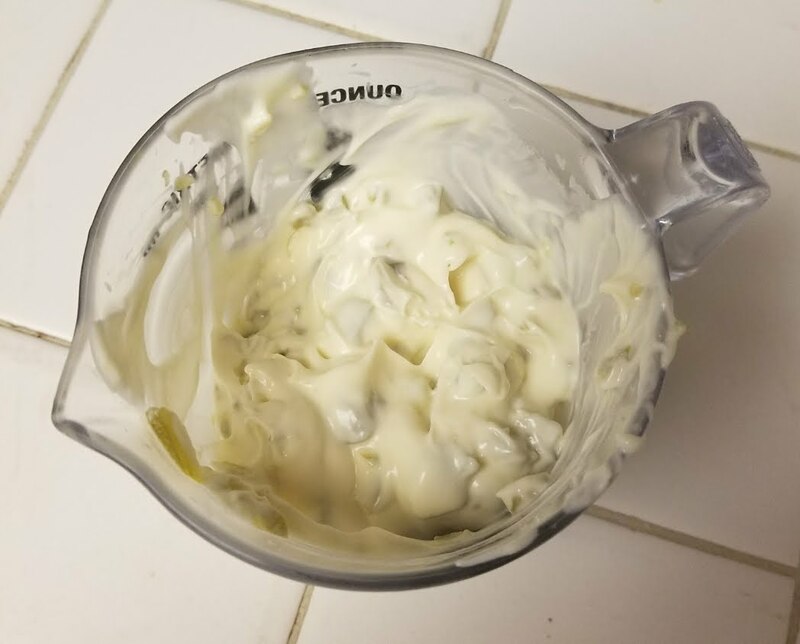 In a small bowl, mix the mayo and the jalapenos. Make sure you do this so it can sit for a while. 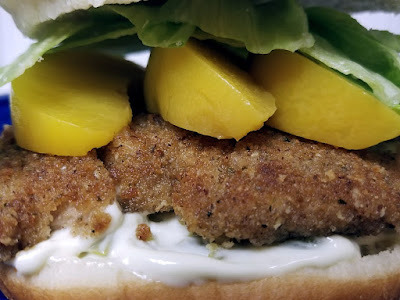 When the jalapeno flavor seeps into the mayo, it's really, really tasty. In another bowl, mix the pecans and the breadcrumbs. Dip the chicken pieces one at a time into the breadcrumb mixture until they are fully coated, and shake off any excess. 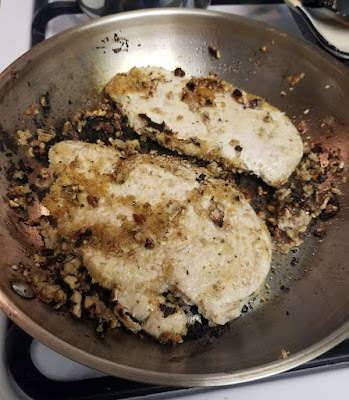 The coating completely fell off the chicken, stuck to the pan, and burned, prompting Dennis to come out of the office and say something to the effect of, "That's not dinner I smell, is it?" I would recommend a couple of quick seconds in a food processor for this coating. In a skillet, heat the oil over medium heat, then add the chicken and cook, turning to make sure both sides are golden brown and the chicken has reached an internal temperature of 165°F. Place chicken on paper towels for any necessary draining. Spread the jalapeno mayo on the rolls (I recommend on the bottom half), then assemble your sandwiches with the chicken, lettuce, and peaches. I realize this combination of things sounds insane, but you're going to have to trust me. Don't worry -- it's not chunks of tomato. 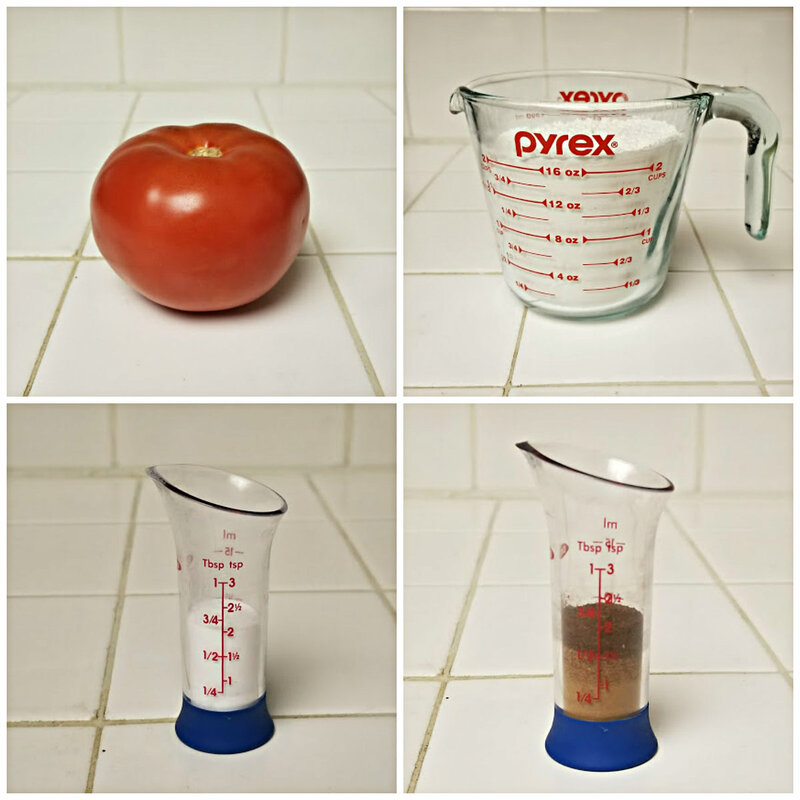 It's a blended tomato. Does that help? (I feel like that doesn't help). Also, the original recipe called for dried pineapple, but I couldn't find that, so dried pears it was, and and they work really well! Finally, the recipe (both in the magazine and online) failed to give a temperature to bake these at, so I went with the standard 350°F, and that worked out great. Make these to bring into the office this week to combat the winter blues I know everyone is feeling at this point! 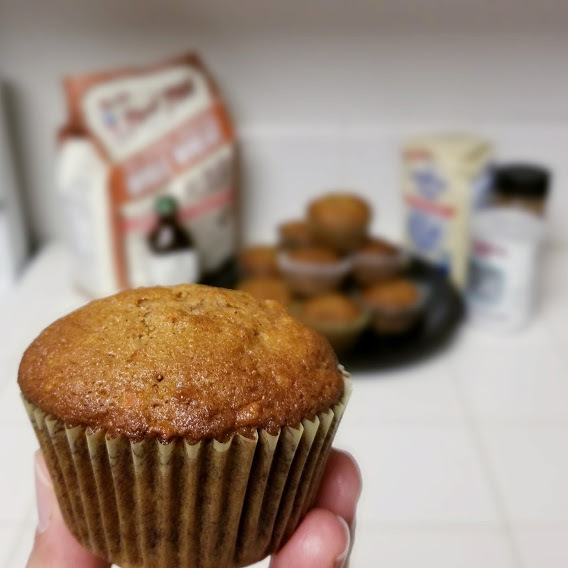 Preheat over to 350°F and line muffin tin with paper liners. In a blender, puree the tomato to make about 1 cup of puree. In a medium-sized bowl, whisk together the flour, baking powder, allspice, and salt. In a large bowl, whisk the sugar, oil, and tomato puree. Beat in the eggs, then beat in the flour mixture. Mix in the fruit, carrot, and coconut. 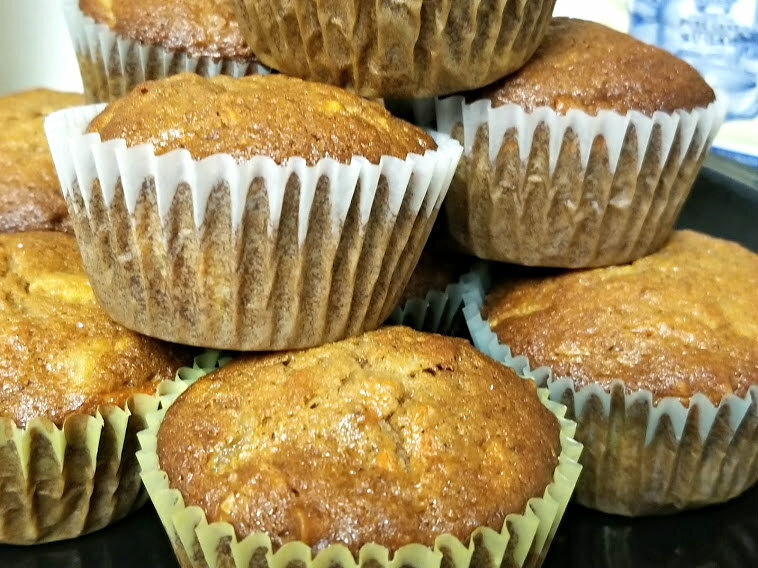 Divide the batter amongst the 24 paper-lined muffin cups. Bake for 18-20 minutes, or until a toothpick inserted into the muffins comes out clean. Let cool on a wire rack. 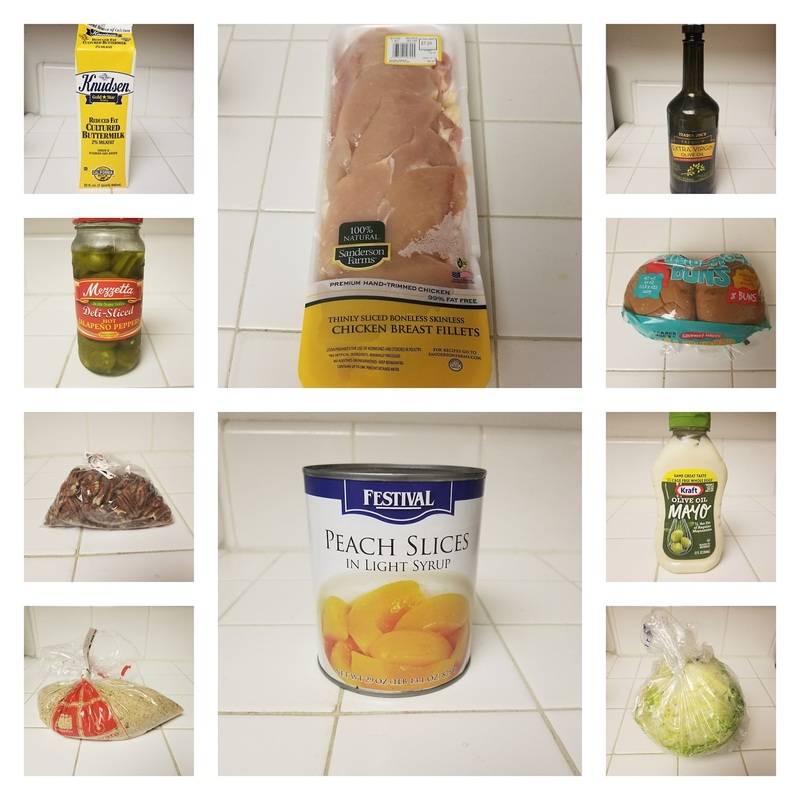 I bought an Instant Pot a couple of years ago because I was seeing them everywhere, and they were getting rave reviews. Before Christmas one year, I saw one for the lowest price I'd seen them, so I snatched it up. I didn't know what to do with it. I'd never used a pressure cooker before (which is essentially what the Instant Pot's main purpose is), and the pressure cookers I remembered from my childhood scared the crap out of me. I finally busted it out when Dennis mentioned that he'd really like a pot roast, and I realized I could make a pot roast in about an hour rather than the several hours they traditionally took to make if I used the Instant Pot. 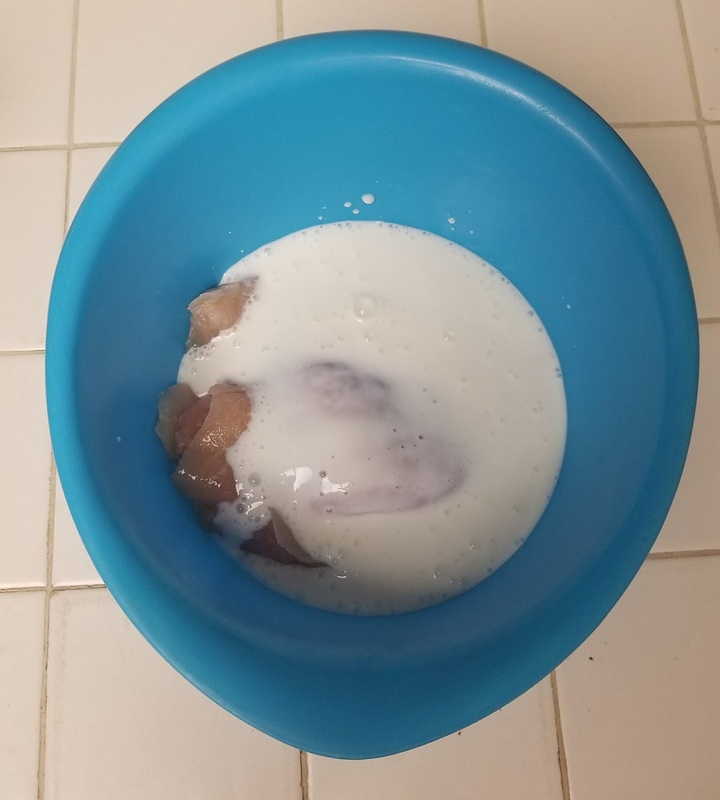 In this Instagram post, you can see the first time I released the steam on a pressure cooker (Uh, if you use an Instant Pot, don't do it like this, because the steam escaping also has fat in it, and you'll have grime all over everything in your house if you don't put a towel or something on the escaping steam), and in this post, you can see the 4th pot roast I made in a month because it was so good. Anyway, The Instant Pot is super cool. I don't know if I'd call myself a member of the Instant Pot cult, but it's very handy for making foods that usually take a ton of time more quickly. When I found this recipe for Polenta Cacio e Pepe (polenta with cheese and pepper), I marked it as one to make before I realized that it called for the polenta to be made in a pressure cooker...and then after paging through my Instant Pot instruction guide, I realized the thing has a button on it specifically for "porridge." Bingo! Also, I made this for dinner, and as we were eating it, Dennis, who is vehemently anti-savory grits said, "This is grits." 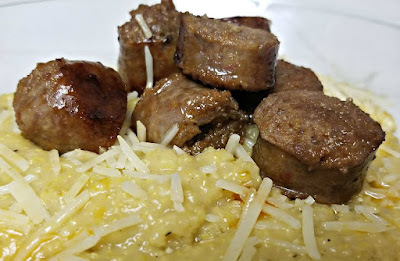 I said it wasn't, but then we determined polenta and grits are basically the same thing, and I have the distinction of making the first savory grits-like dish Dennis has ever liked. 50 points to Slytherin! 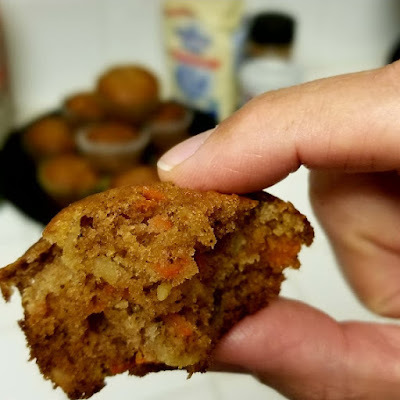 The original recipe does not call for sausage, but I thought it would be a nice addition, and that's why, if you ever look at my recipe labels, I have this one marked as Vegetarian. It could be vegetarian, and the original recipe is vegetarian...it's just that my modifications made it not so much vegetarian. 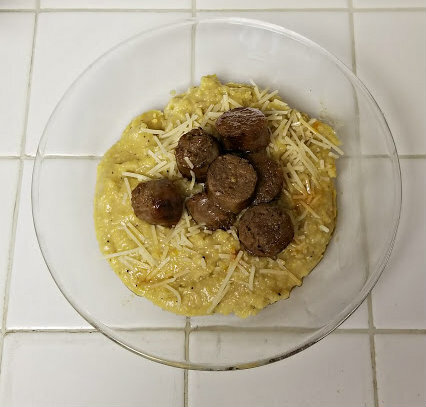 If you don't have an Instant Pot, just make the polenta the old-fashioned way! This is a great wintertime warm, filling meal, by the way, so it felt like a good January recipe. Press the Saute button on the Instant Pot and add the broth (or water). Combine the polenta, 1 tsp. kosher salt, and pepper to taste in a small bowl. When the liquid begins to simmer, pour in the polenta a little at a time while stirring to avoid clumping. Put the lid on the Instant Pot and make sure the valve is set to Sealing. Press the Keep Warm/Cancel button, then press the Porridge button. Adjust the time to 8 minutes. 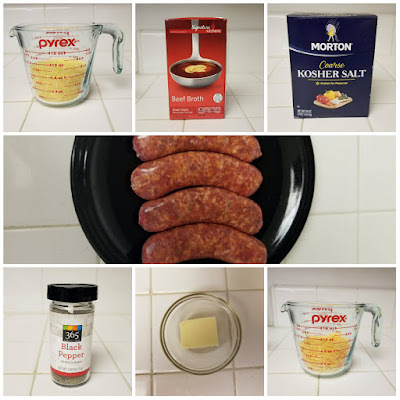 (If you're using the Italian sausage, start cooking it at this point and cook through until the temperature in the center of each sausage is at least 145°F.) Slice the sausages. Once the 8 minutes run out, leave the Instant Pot on Keep Warm for 15 minutes to allow most of the pressure to subside on its own, then turn the valve to Venting. Remove the lid and stir in the butter, both cheeses, and salt to taste until well-combined. Put the polenta into bowls and top with more Parmesan cheese, pepper, and sausage. Happy 2018 everyone! I hope your holidays were good, your hangovers were short, and your year will be awesome. Welcome to my inaugural Magazine Monday! You know how Sarah Cooks the Books all started out because I have a ton of cookbooks I wasn't using? I'm starting Magazine Monday because I have a giant file of recipes I've ripped out of magazines that generally just kind of...sit there. They're well-organized and filed neatly, but they don't do anything. So I'm going to try (try...you guys know how things around here can get) to do a new magazine recipe every Monday for the next 52 weeks. I managed to update my Instagram every single day last year, so I clearly can keep up with things like this, but let's see if I will. 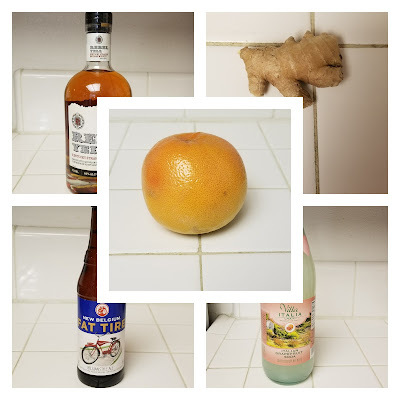 You would think that as the first blog for the first day of a new year, I'd be encouraging you to drink green juice and eat lots of kale and detox after the holidays with...whatever one detoxes with. But no. I'm encouraging you to drink more booze. 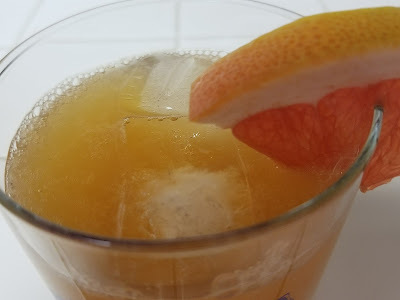 This cocktail is actually intended as a summer drink, I'm certain (considering it was in the May issue of a magazine), but since I live in Southern California, I guess that's all relative. Pin this one for when you're sitting around your pool this summer and want something fruity but with a little bit of a punch. That's this. I couldn't find grapefruit beer, which is what the original recipe calls for, since it was December at the time, but I used a Fat Tire, and it was good. A lemon beer might be good, too. Basically any kind of beer that isn't super dark and heavy. 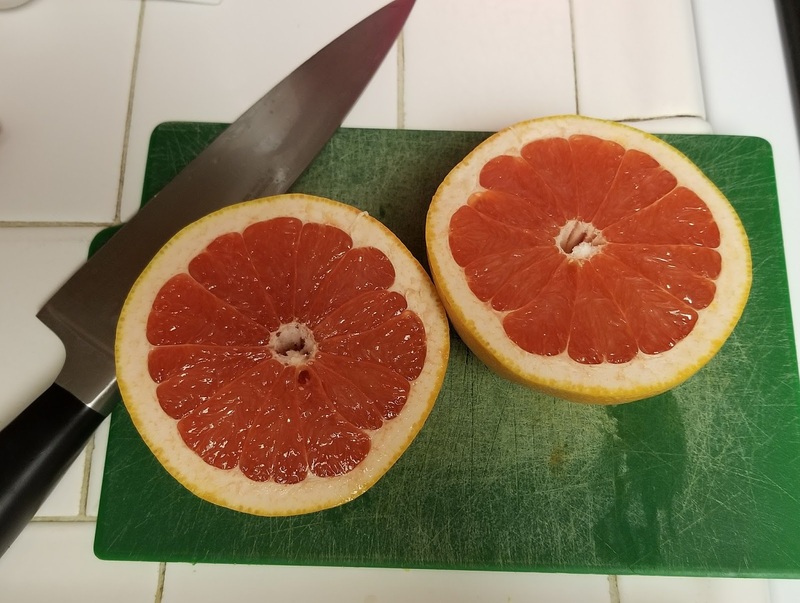 Slice one round of grapefruit to use for garnish, quarter the slice, and juice the remaining grapefruit into a pitcher. Stir in the beer, soda, and bourbon. Fill 4 glasses with ice. 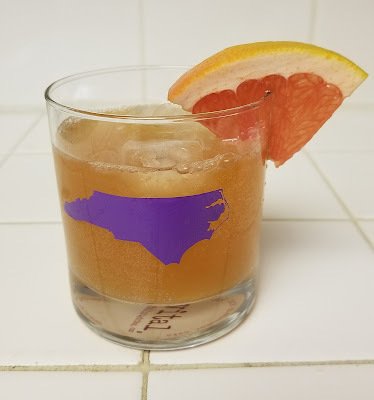 Pour the cocktail into the glasses, and garnish with the sliced grapefruit.